← It’s the Weekend, It’s Beautiful & You Gotta Zee This! How does it happen every year? I think there is some sort of conspiracy that the days get shorter around October 1st and then the holidays just suddenly are upon us. Consider this your warning….in a little over eight weeks we will be celebrating Christmas. Don’t take me wrong, I love this time of year. I just wish my new iPhone assistant Siri could take over and do the prep work for me! On a recent beach trip with some college friends of my husband’s, one of the wives was in charge of breakfast the first day. We always sleep in on vacation so Mr. 25th Hour Gal and I were the last two up that day. We were told that the Beach Breakfast Mix was in the refrigerator. I was really hoping it wasn’t something healthy. Not that I have anything against healthy eating, I just wasn’t in the mood that Saturday morning for granola and fruit. The Beach Breakfast Mix was a wonderful mix of eggs, bacon, cheese and spices. You spread this on an English Muffin, sprinkle with Parmesan cheese and broil it for about 5 minutes or until it is golden brown. I loved it and it was just what I needed that morning. The best part was that everyone had a hot breakfast whenever they woke up that day. No cold leftovers for those late risers. After returning home, it dawned on me that this would be perfect for the holidays when we have a lot of family in town and everyone seems to eat breakfast at different times. Especially great for Thanksgiving morning when Mr. 25th Hour Gal is preparing the Turkey and I am making endless casseroles and desserts (I don’t want anyone to go hungry at my house). So, here is the recipe. Thanks to Mary E. for sharing. Mix together and refrigerate. 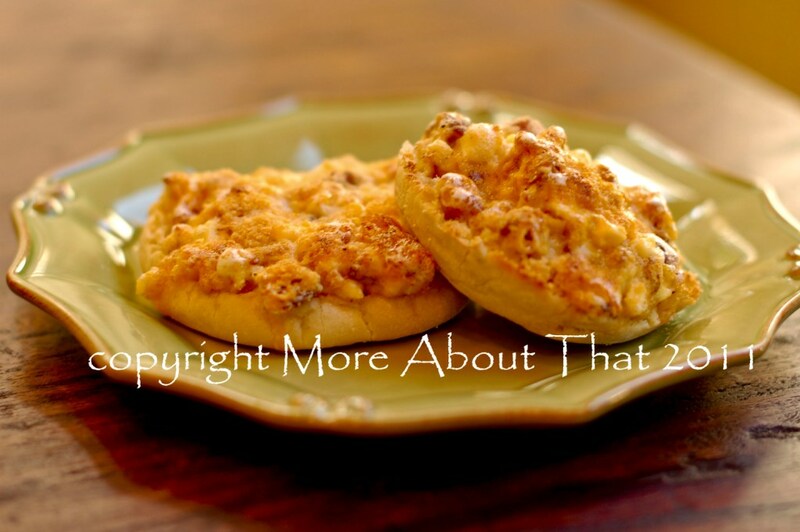 When ready to serve, spread on a split English muffin. Top with grated Parmesan and place under the broiler under golden brown. Enjoy! What is your favorite holiday recipe? I would love to have a few new recipes this year ~ 25th Hour Gal. Very delicious! Holidays are a perfect occasion for this recipe. Sounds great. I will have to give it a try.